Bathroom renovation and kitchen remodeling are at the top of the list when it comes to dressing up your home. If there is something functionally wrong with your house, like a leaky roof, that is what you should address before you take on any other kind of home renovation. Assuming the functional aspects of your home are good, renovating your bathroom is a smart investment. If you are planning on selling, bathroom renovations can increase buyer appeal. On the other hand, if you plan on continuing to live in your home, renovating the bathroom adds comfort and enjoyment to your life. Having a nice bathroom doesn’t have to be expensive. 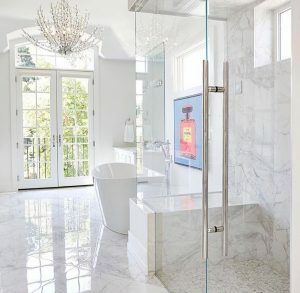 Here are some bathroom renovation ideas that can make your home feel beautiful and luxurious. This is a simple upgrade that can make a real difference in your bathroom’s appearance. Think about the overall look of your home. Is it traditional? Is it contemporary? Is it a “country” look? Rustic? Modern? Themed? When looking for bathroom fixtures, try to match the overall theme of the house. Bathroom light fixtures should accent your décor. Accent light fixtures are a great way to “bring up” the overall appearance of the house, especially in the bathroom. Another consideration is the amount of lighting you need. If you have dark paint, dark vanity and cabinets you might need more lighting. Choose bathroom accent lighting that has the appropriate number of light bulbs. The important thing to keep in mind is whatever lighting you have should allow you to see your skin properly. Makeup colours and clothing should also look natural. Lighting that doesn’t allow you to see the real colour will end up being unsatisfactory. Energy efficient bathroom lighting is a good idea if you are going to have a bright room with lots of light bulbs. Use the latest Energy Star rated light bulbs to save money and protect the environment. Vanity lights should be no wider than your vanity or cabinet width. Your cabinet may be wider than your mirror, so your lighting can be wider than the mirror. You can mount bath bars high off the floor (78 inches is recommended) and center them with the cabinet for a clean, finished look. If you have a very long vanity or double sink setup, you may want to consider using more than one of the same bath bar to get the job done. You can use sconces in rooms with small mirrors. Place one sconce on either side of the mirror at least 28 inches apart from one another and 60 inches up from the floor. Sconces are often recommended because they increase the amount of usable light in the room, making it even easier to see yourself in the mirror! Sconces are also a great way to add even more style to your bathroom. Instead of sconces, you can hang matching pendant lights. Pendant lights should be suspended from the ceiling on either side of the mirror. Hanging pendant lights 28 inches apart is a good rule of thumb. Ever been blinded by bare light bulbs when coming out of the shower? Not very pleasant, is it? Never use exposed bulbs in the bathroom! To increase the comfort to your eyes, always use bathroom fixtures with coated, dipped, frosted or opal glass for a flattening effect. 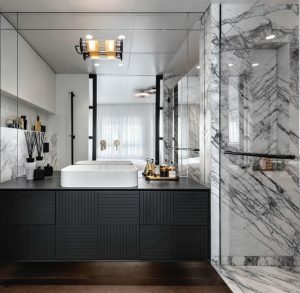 Most bath bars and bath lighting options will already have this type of glass, but in case you take a shine to lighting fixtures not specifically designed for the bathroom, remember this rule. Compact fluorescent bulbs or even LED bulbs can be used in place of standard bulbs in nearly any bathroom. Fluorescent or LED lighting is ideal for bathrooms because both choices emit much less heat than incandescent lighting, last longer and save energy. People 65 years or older need four times more light than those 25 years and younger according to the Illuminating Engineering Society of North America. It’s a good idea to have brighter than normal lighting in the bathroom.